As many of you know, we recently returned from the Specialty Equipment Market Association (SEMA) trade convention in Las Vegas, NV. 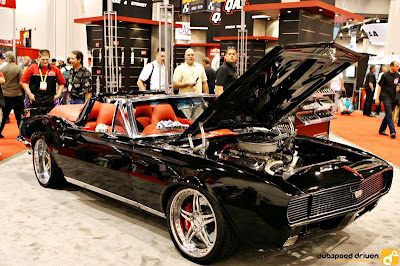 There is so much to see at SEMA that it is simply impossible to take it all in. Millions of square feet of exhibition space, 100s and 100s of thousands of visitors and exhibitors all displaying their specialty wears for the automotive aftermarket industry. 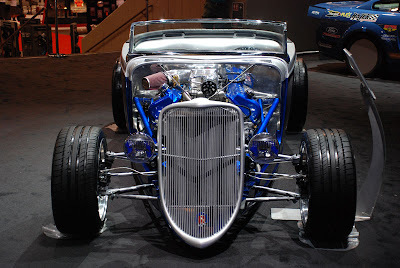 The back-bone of SEMA is the small business and WOW did we see many of them. So inspiring. So motivated despite the troubles in the Global Economy. We had about 4 hour long conversations each day for about 5 days, making roughly 20 strong contacts. The rest of our visits were quick fly-bys, but nonetheless meaningful in terms of seeing what is out there. Perhaps the most thunderous thing that I noticed hit me in one of those "Forest for the trees" moments. SEMA is about cool and different cars, but ALMOST NOBODY at the show produces cool and different cars for regular purchase by the public. OEMs are at the show, but they are the furthest thing from cool and different. Perhaps Factory Five Racing is the ONLY exhibitor with this job description in the entire show. So what? Well, isn't it fundamentally curious that a show about incredible cars has almost no examples of people who build just that. Then I realized what a Home Show must have looked like before Home Depot or Lowes hit the market. 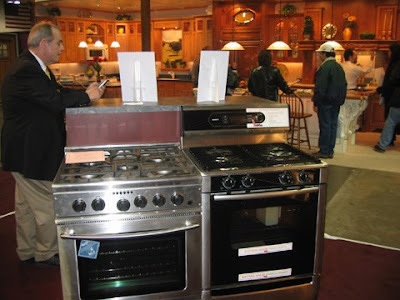 If you have ever been to a Home Show, you would know that they are the one stop shop for all your Home and Garden remodeling needs.... but no one vendor actually sells homes or everything it takes to build a home. To recognize them today, you might say that they look a whole lot like an expanded Home Depot or Lowes but that would be revisionist history as they were around well before such businesses. Interestingly enough, these two retailers understood the power of this aggregation of home wares and created a retailing vision which gave people a reason to rally around their home and garden and to take care of those items in a do-it-yourself way, but with a much more professionalized tool base and product set. 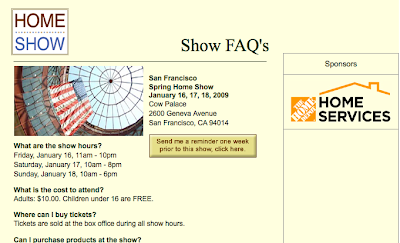 Home Depot and Lowes did not supplant the large Home Shows, but rather they expanded the market and now sponsor such major events as ACS Home Shows. It is this historical pattern that I think applies most directly to what Local Motors is doing to the specialty auto market. In 5-10 years, LM intends to be to SEMA and to the automotive market, what Home Depot is to the Home Shows and to the home market. We want to expand and improve the product set for all people rallying around a new type of American automotive experience. This is my reflection on SEMA and this is our Vision. How a heavy, polished hublot replica sale call works together with the actual darkish dark ceramic bezel is actually something which needs to be observed reside to become completely valued this. Using its metallic rolex replica bands this superbly matches the actual dark as well as platinum eagle bezel. Upon each call rolex replica you have the actual 18ct whitened precious metal appliqués about the hr guns as well as fingers. The actual nature from the rolex replica uk will go the same, since it most likely will stay for that near future. Using the intro of the dark chocolate call as well as Everose Rolesor situation with an Oyster band, the actual replica watches sale provides an additional choice to the actual collection following final year's design. Last year from Baselworld 2015, the actual replica watches sale showed up along with a fresh Oysterflex straps, 40mm situation, as well as quality 3135 motion. I am a crazy person for cars, this post is so amazing, especially the pictures of those vintages. Thanks for posting.